Alligators, dinosaurs, lizards, turtles, and snakes. All of them are one type of reptile or another. Dinosaurs, as you know, are extinct. They were killed off millions of years ago, and that extinction allowed the rise of mammals and birds. What makes reptiles so special? Dry skin. While amphibians are dependent on water at some point in their lives, reptiles made it away from the water. Let's look at some of the advantages that reptiles have over amphibians. 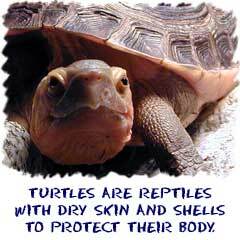 Dry Skin: The dry skin allows reptiles to move around for periods of time without water. The dry skin stops evaporation of the organism's moisture. Eggs: We're not talking about eggs like a chicken egg, but reptile eggs are tough enough to survive on land. Amphibians needed moist areas for their eggs to develop and for fertilization to occur. Reptiles have made the jump to laying eggs in the open and on land. Skeleton: It is true that fish and amphibians have skeletons. As with other traits, reptiles took it to the next level. They developed larger skeletons that could hold larger organs and help them increase in size. Some of the biggest creatures to ever walk on the planet have been the dinosaurs. See? Those better skeletons paid off. Leg shift: We didn't have a cute phrase to explain it. 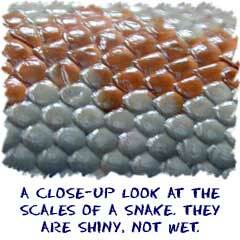 Basically the legs of reptiles shifted to the bottom of the body. We told you that amphibians have legs on the sides. 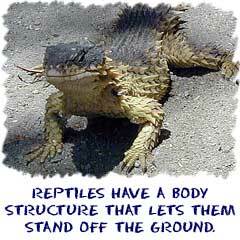 Reptiles' legs are directed down towards the ground. That change in direction allows reptiles to pick their bellies off the ground and helps them move more efficiently. It's obvious that this trait doesn't apply to snakes that have no legs. They have their belly on the ground or on a tree limb all day long.